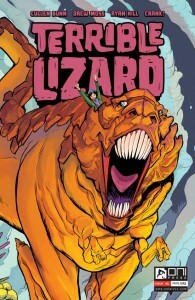 Terrible Lizard #1 is the first in a 5 issue mini series from our friends at Oni Press, written by industry favorite Cullen Bunn with art by Drew Moss. Imagine if you can for a moment the movie Hellboy. Remember how Professor Broom adopts the little devil after he enters our world through a inter-dimensional portal? Well, if you replace the senior citizen with a fourteen year old girl and the red skinned devil with a Tyrannosaurus Rex, the result is this book. This is not to say that the book is not entertaining, because it is. The premise is one however that has been explored before in other media (like the Iron Giant for instance). Bunn has really carved a niche in the industry as a writer whose work in the horror/noir genre rivals that of his many competitors. However, with Terrible Lizard, Bunn is diving head first into the all ages genre and in my humble opinion, he has nailed it. The story itself is quite simple. We are introduced to our main character, Jess, in the early panels of the book. Jess lives in a super-duper research facility where her father performs all manner of interesting scientific experiments for the US Government. One such experiment involves the use of portals to induce time dilation. While the science behind these experiments is sound, it is from this point on that the reliance on real world physics starts to fade away. Jess’ father accidentally brings a dinosaur through the portal. A T-Rex no less. However, while the military’s first instinct is to aim a gun at it, Jess takes a far more measured response and chooses to defend the prehistoric beast instead. It is at this point that the relationship between Jess and the titular dinosaur begins to take shape. This really reminded me of the Godzilla animated series from the late 90’s that saw Matthew Broderick’s character from the film become friends with the King of the Monsters. Drew Moss’ artwork is really strong in this issue. The character deigns and backgrounds are realistic enough to make you believe that this could be true while still introducing a cartoonish aspect to appeal to younger readers. However, where Moss excels is in the designs of the monsters. The T-Rex looks amazing and it appears that readers are going to be introduced to a Godzilla style rouges gallery of other-worldly monsters in the remaining issues. All things considered, this is a pretty good book. I am continually impressed at the work coming out of Oni Press in the last few years and this book represents another title in an increasingly popular roster of unique stories told by some of the industry’s best and brightest writers and artists. Parental Concern: Low. This is really meant to be a bit of harmless fun for younger readers. It will definitely appeal to fans of Godzilla and other monster franchises.